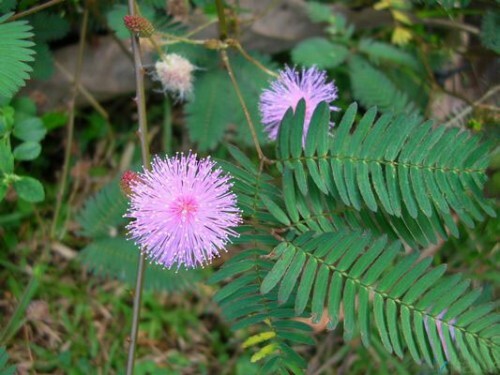 Mimosa pudica- Sensitive plant is another name for the Mimosa pudica. It delights children because its leaves close when you touch them and then open again after a few minutes. The stems are prickly; the flowers are delicate pink balls. Mimosa pudica shrubs grow up to five feet tall and three feet wide. It is fast growing, does well in many soils and needs temperatures from 60 to 85 degrees Fahrenheit for optimal growth. Put small rocks, pebbles or gravel in the drainage container for your Mimosa pudica houseplant; they'll help increase the humidity by keep water in the drainage container. Don't put the pot into the water directly; it must sit on the rocks or pebbles. Zone 10-11 if grown outdoors.